To take your investing business to the next level choose your preferred way to learn. Remember – the webinar special offer is only valid until Friday October 5th at 11:59pm! 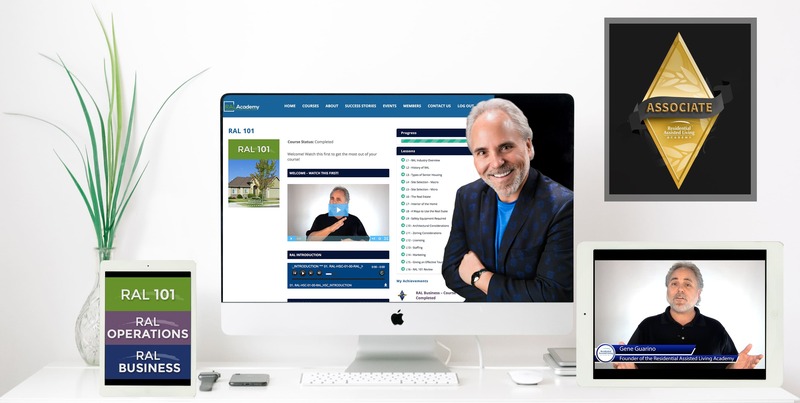 The Assisted Living Business Accelerator is a Certified Home Study Course containing 30+ lessons across 3 modules RAL 101, RAL Business & RAL Operations. Watch them, listen to them or read them. Learn at your own pace, your choice! In RAL 101 you will learn about everything from site selection, architecture and interiors to safety, zoning and licensing. Also, learn about staffing and marketing strategies. In RAL Operations you will learn about everything from finding high paying residents to setting up systems and building a team. Figure out nuances like food and activities for the seniors. In RAL Business you will learn about the business and financial aspect of it all including start-up capital requirements, funding, expansion and other key elements of your successful business plan. 3 Day Fast Track – Assisted Living Business Accelerator Event LIVE! Here’s your chance to learn the step-by-step RAL system, live and in-person, including an on-site private tour to existing homes to interaction with owners and staff. This is the absolute best and fastest way to learn the system for yourself and be ready to take action the moment you leave. You will discover How to Find, Fill and Fund Your RAL Home. You will meet the Facility Manager, House Manager and Caregivers on our Live Home tours. You will learn to Maximize NET Positive Cash Flow Without Risking Your Shirt. You will get the Foolproof System for Evaluating the Right Property and more! COMBO: Home Study System & 3-Day Fast Track Event LIVE! The entire home study system PLUS the 3-day LIVE training event.